We’re off! We’re on the road for our first great overseas travel odyssey with backpacks, and four-year-old twins. 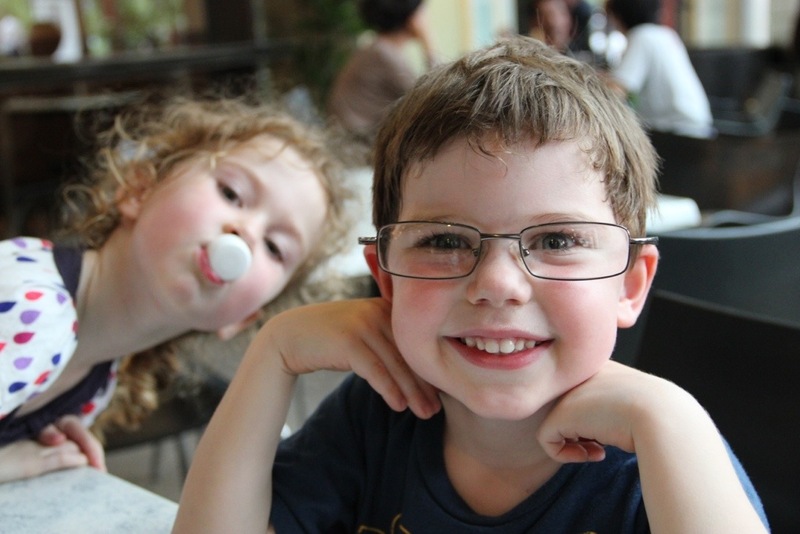 Well, technically, it’s our second great travel odyssey with kids – we spent a few weeks in California last year – but that was in a hire car, with suitcases, and an esky, and fold-up chairs, and very possibly a kitchen sink. THIS is more like real proper ‘travel’: planes, trains, buses, taxis, and feet. Lots of feet. We’re travelling Malaysia, because we never made it here on our previous, pre-kid south-east Asian adventures, so we figured it was a good place to start. It’s easy to get around, close to home, and not too pricey. Plus, it’s hot. Sydney winter, begone! Give me hot and muggy any day. The weather, however, whilst brilliant for my mood, hasn’t been so conducive to blogging. It’s hot, and beer is mandatory in the afternoon whilst travelling in the tropics. By the time the kids are in bed, I’m at least two Tigers down, and pretty close to sleep myself. Stephen is lying snoring on the lounge behind me as I write. Ah, the traveller’s life. So, I’m going to use pictures to tell my stories: lots of pictures, and not too many words. Well, I’m going to try not to ramble on too much, but if I do, I’ll blame the beer. 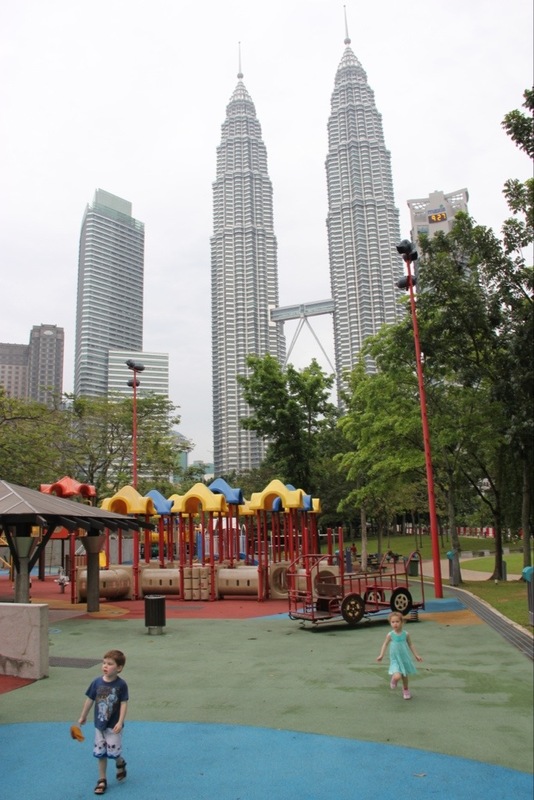 Our hotel in KL was just around the corner from Kuala Lumpur City Centre Park, and with the kids needing a run-around after the eight-hour daytime flight the day before, the park was the first place we visited. Boy were we glad that we did! 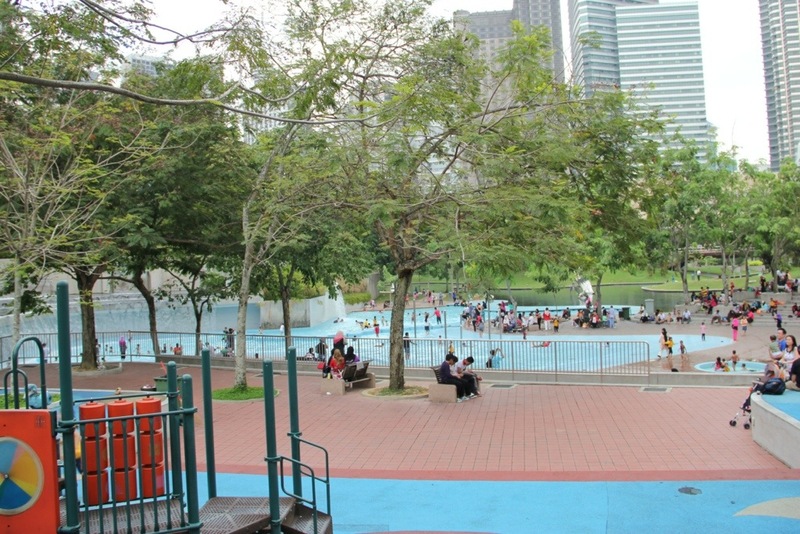 It’s a beautiful green space in the heart of the city centre, in the shadow of the Petronas Towers. But what is even more awesome about it is the amazing children’s playground in the centre of the park, including a water-play and pool area. If you think the pools look cool, check out the playground! When I say that the playground is the biggest playground I have ever seen, I’m not exaggerating. It looks as though they built a playground, and then decided that they needed another, and another, and another, and another… and… yes, another. It’s a little city inside the city, as if the playground has expanded in an uncoordinated urban sprawl, with inner suburbs leading to outer suburbs, where slides, and swings, and tunnels, and bridges have multiplied and given birth to more slides and swings and tunnels and bridges. It’s plastic fantastic, but heaven for the kids. On Friday we wondered whether it would ever all be used, as the park was empty. Petronas Towers? What Petronas Towers? On Saturday, we found out that the playground is VERY popular indeed. We couldn’t resist a splash, either. We weren’t quite prepared with swimmers, but we made do. Oh, yeah, Petronas Towers were there again, too. Not a bad spot to hang out for an afternoon! 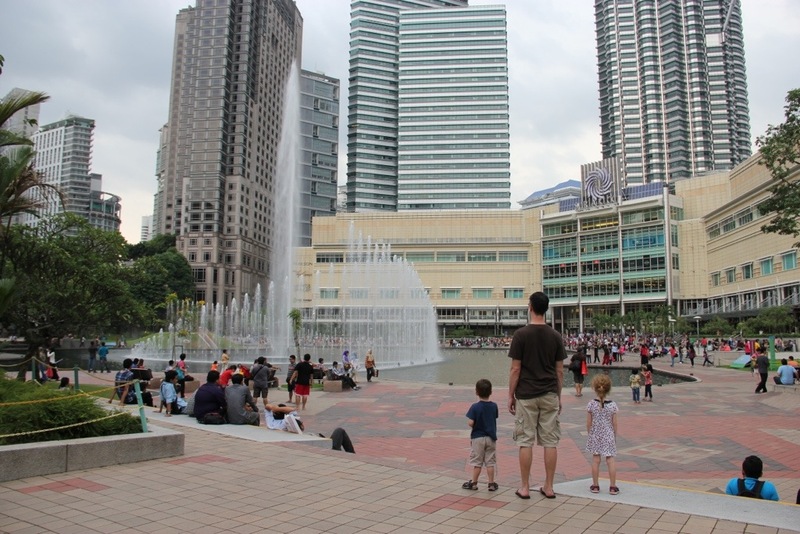 There are dancing fountains in KLCC park, which are fun. 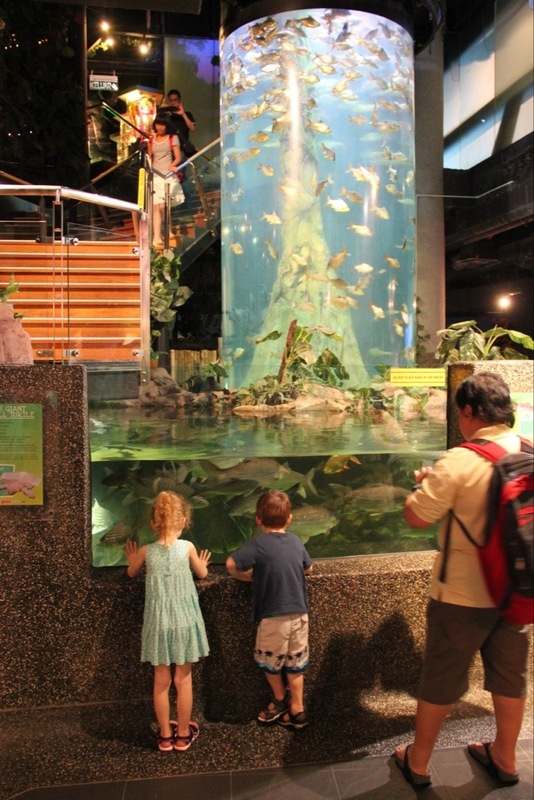 The Aquaria KLCC is another great activity for the kids, right next to the park. What have we learned so far? There is no way we could get around a city with kids like we did without them. The whinging is not worth it. So we decided to see less, and enjoy what we see, without worrying about what we miss. For example, we didn’t get up the Petronas Towers. We looked at them a lot, but didn’t make it inside. We weren’t organised enough to buy tickets and we just ran out of time. But I think the kids got a lot more out of splashing about in a big pool with a bunch of other kids, who may not have spoken their language, but who all spoke the common language of laughter, than they would have got out of looking out of a tall building at some other tall buildings. We’ve been up Centrepoint, after all. Stay tuned for my next post (beer permitting) on our trip to the night markets in KL’s Chinatown, and our visit to the Batu Caves and Hindu Temple. wonderful adventure, have a great time showing your kids the world. Thanks Kath. We’re tired, but happy! Awesome holiday – I just love travelling and once you’ve got kids you have every excuse you need to go to the kid parks and kiddy activities and have fun, while looking like an awesome parent all at the same time! That is definitely one huge playground! Gosh, a kid could get lost there. Oh yes, it was hard to keep an eye on them. Certainly not relaxing for mums and dads! I’m am so glad that you are enjoying Malaysia. It sounds like your family has a wonderful adventure in store. 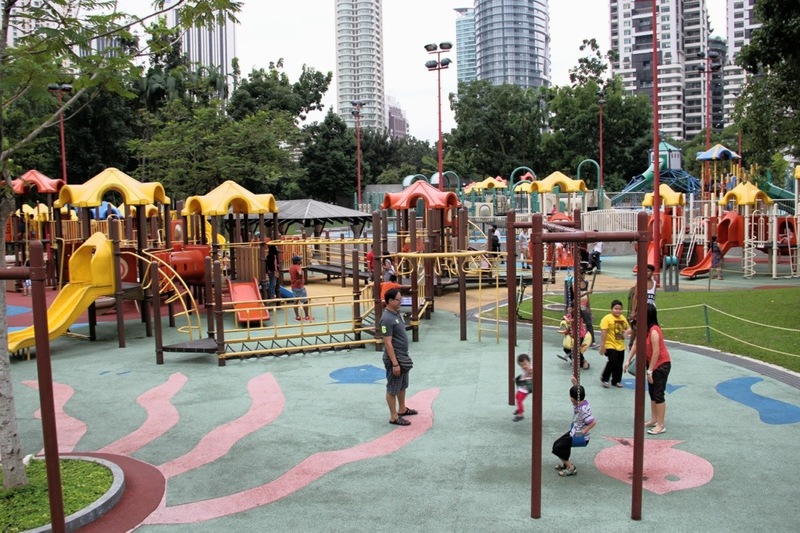 My kids also enjoy that big playground in KLCC. Yes, it is huge. I lost track of both kids when they were playing tag with a big group of children and it took me a looooong time to find them again. I look forward to hearing more about your adventures. I can imagine it would be easy to lose them! I had to keep following them as they went from one play area to another. Awesome, but tiring for the old people! Haha! Loving your Malaysia!! Meh – Petronas Towers – just big buildings really. That aquarias though? AWESOME. Loving your photos and can’t wait to see more. Glad the with-kid adventure is going so well. Yeah, that was the first day! haha. We have our moments! Like tonight when we were just too excited to sleep, and a few tired meltdowns… the kids too! But for the most part we are doing ok. 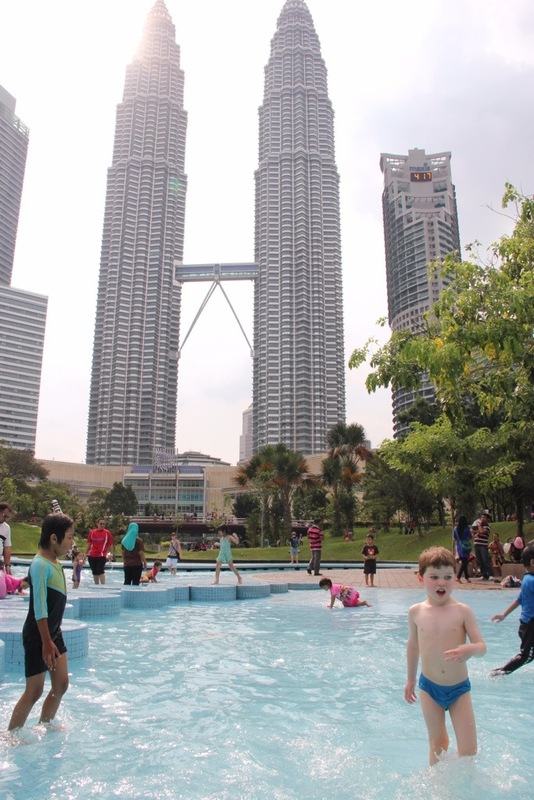 If you’re going to be splashing around in a pool, what better place than with Petronas Towers above you. I’ve never seen them in person — would love to! I agree that it was a great experience for the kids to be sharing the international common form of communication — laughter. What a wonderful trip to be taking with your family. Enjoy! Thanks Cathy. Yes, the towers are certainly an impressive sight above the park!